There arguably is not anything sadder in this world than the deplorable plight of elderly cats. Often sickly and with their physical and mental powers on the decline, they routinely are abandoned by owners who most assuredly realize that they are ill-equipped at their advanced years to secure sustenance, shelter, and veterinary care for themselves. In addition to those deprivations, the psychological loneliness and fears that accompany such a rude uprooting so late in life are surely even more difficult for them to manage. Likewise, their odds of receiving anything other than either abject neglect or jabs of sodium pentobarbital from a callous and uncaring public are almost nil. That pretty much sums up the dire straits that an estimated eleven and one-half year old handsome orange-colored tom named George found himself in last September. His already desperate situation was further complicated by the fact that his teeth had all but rotted out of his mouth. The unbearable pain occasioned by his dental woes had made eating such an ordeal that he had withered away to being little more than a bag of bones. In all probability he would not have lasted much longer on his own if he had not had the good fortune to unwittingly stumble into one of Pets at Home's retail outlets in Liskeard, Cornwall. After offering him some food, employees of England's largest pet store chain contacted Margaret Green's Wingletang Rescue and Rehoming Centre for Dogs and Cats in Tavistock, Devon, which promptly came and collected him. "It was quite a shock to see how skinny George was when he first arrived here," the charity's Deana Perrin told The Plymouth Herald on September 30th. (See "Abandoned Cat Heads to Pets at Home to Find Help.") "His teeth were also in a terrible state which would have meant eating was difficult and very painful for him." Almost nothing is known about either George's past or how long that he had been sleeping rough. Based upon his friendly demeanor and enjoyment in cuddling, he obviously at one time had had a loving home. That observation also is buttressed by the telltale imprints left on his fur. "It was obvious that George had been in a home at some point as he had a mark around his neck where a collar had been," Perrin added to The Plymouth Herald. "At some point his collar must have been excruciatingly tight as the skin around his neck is completely bald." At Margaret Green's, George's teeth were extracted and he was placed on a diet of soft food. That expedient worked miracles in that he immediately began to put on weight and for the first time in a long while he found himself free of pain. Anyone who ever has suffered from prolonged dental pain, especially that associated with either a wisdom tooth or an aggravated nerve, can readily identify with what life must have been like for him without having access to analgesics. Unfortunately, the fur on his neck has yet to grow back and it is unclear if that is going to create problems, such as infections and sun damage, for him. Although photographs of him have appeared in the local press, his previous owner has not come forward to reclaim him. That in turn can only mean that the individual either is dead, living elsewhere, or does not want him back. Although Margaret Green initially had high hopes of promptly placing him in a new home, those plans have yet to come to fruition. 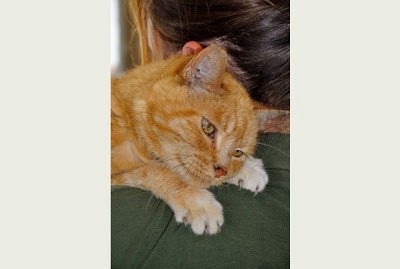 Since he is an elderly cat with special needs, the charity is looking to place him in a rural setting. Since his arrival at the shelter he has become a big favorite of both staffers and volunteers alike and they accordingly are not in any hurry to push him out the door. Best of all, they insist that he is welcome to stay with them for how ever long it takes in order to find him a new home. Anyone interested in adopting this wonderful and long-suffering cat can contact the charity by e-mail at wt@margaretgreenanimalrescue.org.uk. It also can be reached by telephone at 44-01822 810215. Margaret Green most likely would prefer to place him with a family somewhere in either Devon or Dorset because doing so would spare him the ordeal of having to undergo a long and grueling trip by either plane or car. If a nearby home does not eventually become available, however, the charity could be forced into looking farther afield. Regardless of where he finally ends up, George is destined to make a fabulous addition to someone's home. Old cats not only have value, they simply are the best and every moment spent in their company is to treasured! "Until one has loved an animal, a part of one's soul remains unawakened," Anatole France once observed and there is not any better way of beginning that process than by opening up one's heart and home to an elderly cat. Whether he lives eleven more days or another eleven years, whoever gets custody of George will soon realize that they are truly the lucky ones for being able to share his life. Whereas being abandoned during the twilight of life is bad enough in its own right, many cats that wind up in that terrible predicament are ill-suited to make it on their own because of, ironically, the naked abuse and mutilations that they have suffered as the result of their domestication. Others have grown obese as the result of having been sterilized and subjected to a sedentary, indoor lifestyle. Others suffer from diabetes and urinary tract problems as the result of having been fed a steady diet of cheap kibble and other unhealthy foods. In spite of the myriad of difficulties that they face, they are the lucky ones in that they at least have a chance, no matter how slim, of staying alive. The same most definitely cannot be said for those that are deliberately killed off by the collusion of their owners and unscrupulous veterinarians. Perhaps cruelest of all, these cats never even know what it was that hit them and as the result go to their early graves ignorant to their last breaths of the perfidy that lurked in the owners' malignant hearts. Used, abused, liquidated, and then casually tossed into the trash like yesterday's newspapers is their lot in life. Of all the animals only man is capable of such deceit, treachery and, above all, ingratitude. He likewise is so craven and dishonest that he concocts outrageous lies, such as either not wanting to see a cat suffer or the old familiar better off dead argument, in order to excuse his heinous crimes. Since practitioners, unlike some shelters, are not compelled by law to disclose their kill rates, it is anybody's guess as to just how many cats meet their Waterloos in this fashion each year. It does not take much intuition to realize however that the death toll surely must be exorbitantly high. 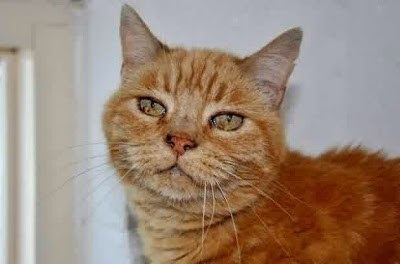 Regardless of whether owners simply abandon their elderly cats to fend for themselves or pay to have them whacked, their treatment of them can only be described as unjust, cruel, and heartless. The proper care of a cat begins with respecting its inalienable right to live out its brief existence to the very last second and then and only then to die a natural death. Included in that is the right to be free from all abuse and exploitation as well as to be provided with shelter, food, and properly understood veterinary care. Whereas the machinations of the species' sworn enemies, such as ornithologists and wildlife biologists, are legendary, duplicitous owners, moneygrubbing veterinarians, bloodthirsty shelters, and phony-baloney rescue groups actually inflict far greater suffering and carnage on cats. "I have no trouble with my enemies. I can take care of my enemies in a fight," former president Warren G. Harding once proclaimed. "But my damn friends, my goddamned friends, they're the ones who keep me walking the floor at night." In a way it is just too bad that cats lack the prerequisite guile in order to anticipate the evil deeds that their owners and others have in store for them. Since that obviously is not the case, it is precisely their innocence that makes it all the more compelling that their rights be respected and protected.